A 1949 Gallup poll of Americans found that only 15% of the public believed that man would walk on the Moon by 2000. How is it that we accomplished this by 1969? Of course the Cold War and a series of Soviet space firsts played the lead role. But space art also played a role in providing for the population a visualization of what space exploration could be like. Space art still has a role to play in exposing the public to the vision of what it would mean to truly become a spacefaring civilization. There is a precedent for art’s ability to shape public policy. One of my favorite artists is Thomas Moran, an outstanding painter of the Hudson River School. One of Moran’s landscape subjects was Yellowstone, which he visited as part of an expedition in 1871. His paintings of the landscape had such an impact on the public that in 1872 Yellowstone was made our nation’s first national park. If you would like to know more about Thomas Moran and his art, I recommend the book Thomas Moran . Later this month I will be attending the International Space Development Conference in Washington D.C. While it has not yet been confirmed, I expect to be giving a presentation on space art and its power to promote space exploration. Titled Using Art to Promote Space Exploration, the presentation is part history, part call to action. To be considered for a programming slot, I had to submit a 500 word abstract. Imagine my surprise when upon finishing the abstract I discovered that I was over 1,000 words. Heavy handed editing got me down to the 500 world limit. Following is the abstract that I submitted. In the beginning there was astronomical art whose purpose was to illustrate planetary bodies and astronomical concepts. With the advent of science fiction space art came into being as a means of illustrating fictional space ships and off-Earth habitations. In the 1950’s space art migrated from the realm of science fiction to science when artists were commissioned to create illustrations for non-fiction books describing space exploration. A peak of public relations was reached during this period with a series of articles in Collier’s Magazine which became the basis for a subsequent series of programs created by Disney for television. In 1962 NASA created the NASA Art Program to document and celebrate the events and activities of the space program. This and other art commissioned by NASA has been used for multiple purposes including: technical illustration of hardware; public affairs imagery promoting particular programs; capturing the emotional impact of space exploration; illustrating scientific discoveries. Throughout the space age art has been used as a means of visualizing and promoting space exploration. The target of this art has been both the public and public policy decision makers. This art focused on the Apollo program during the 1960’s; the Shuttle program during the 1970’s; the International Space Station during the 1980’s and 1990’s; and the Vision for Space Exploration during the 2000’s. Today the main customers for professional non-fictional space art are space agencies, aerospace companies, and those publications that cover the field. Recent years has seen the addition of marketing the images returned by various robotic missions as art. The initial such project was “Mars As Art” which used Mars Odyssey THEMIS data. Subsequently “The Sun As Art“, “Landsat: Earth As Art” and “Our Earth As Art” programs were launched. These programs raise public interest in space exploration. This is best exhibited by the extensive media and public attention that images from the Hubble Space Telescope have garnered. In addition to commissioning art to illustrate its programs, NASA has also sponsored art contests targeting students. The positive relationship between space exploration and student interest in science is a long accepted one. By sponsoring these contests, NASA is spurring student interest in science, art, and space exploration, as well as heightening awareness of their own programs. NASA has leveraged art to satisfy multiple objectives. The space activist community should take advantage of these lessons. NSS has embarked on a program of support for the space arts. In addition to the traditional venue of commissioning art for Ad Astra, recent years have seen space art programming and shows at the ISDCs. Additionally NSS has conducted two successful Space Settlement Art Contests. NSS leveraged the art submitted to these contests by building corresponding art galleries on the NSS web site and using the winning art to publish calendars promoting space settlement. As chair of the NSS Web Oversight Committee, I plan to advocate for the creation of a Student Space Art Gallery to spur student interest in art and space exploration. 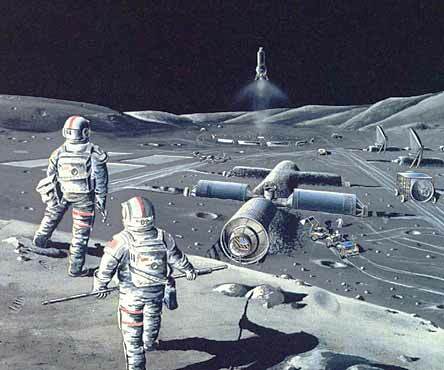 The art used to illustrate this post is of an advanced lunar base and was used as an illustration in the 1992 multivolume NASA publication Space Resources. The entire publication is available as a PDF download from the NSS Space Resources Library. Yesterday I finished up my part in the judging of entries in the NASA Life and Work on the Moon student art contest. The theme of the contest was portrayals of people living and working on the Moon. There were some interesting submissions to the contest. There were a few submissions that ignored the fact that this was an “art” contest and instead submitted presentations, pamphlets, etc. While these were outside the bounds of the contest, it was a pleasure to read through these and learn about what these persons considered to be the benefits of humans living on the Moon. For more contest details, visit the NASA art contest site The Moon: Back to the Future. We judges were to grade the artist’s submissions based on four different criteria: artist statement; artistic elements; creativity; validity. Scoring was 20 points for the artist statement, 30 points for artistic elements, 30 points for creativity, and 20 points for validity. The artist statement was a written explanation of the submitteed art. Unfortunately some artists failed to provide a statement. I’m not sure why someone would spend a substantial amount of time creating an artwork to submit to the contest and then not take the comparatively small amount of time to explain the nature of their submission. The artist statements spanned a wide gamut from simple explanations of the image to complex explanations of the artist’s thinking and planning process. Judging the artistic elements involved evaluating the artist’s use of line, shape, color, texture, etc. For me this represented the most difficult component to judge because such components are highly dependent on the observer’s values. Being creative while adhering to the contest’s rules for validity can be a challenge. One of the more creative submissions was an art deco style advertisement for tangtini – a drink composed of Tang and vodka. Unfortunately the connection between the piece and theme of living and working on the Moon was rather tenuous. As the theme of the contest was living and working on the Moon, the submitted artwork was expected to be realistic in its depiction of the nature of the lunar environment and what living there would be like. Artists had to balance being creative while staying within the bounds of reality. Judging the validity of some submitted art was challenging in this category. For example, there was a very nicely done terraformed moon. But just how valid is that? Unfortunately that piece did not depict any human presence on the Moon. I must say I enjoyed the experience of being a judge in the contest. The last contest I had an opportunity to judge was the NSS Space Settlement Art Contest which ended in January. Every artist should take a crack at being a judge in an art contest. It is one thing to look at a picture and say “Oh I like that” and quite another thing to analyze the picture’s composition and artistic elements with the goal of assigning a grade to the picture. The process can be very instructive. 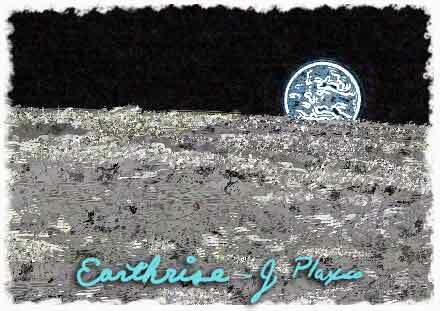 I created Earthrise Over Moon to illustrate this blog entry. As a source I used one of the HDTV images from the JAXA Selene (aka Kaguya) mission to the Moon. I then brought the picture into Adobe Photoshop and used the “Find Edges” filter to create an outline map of the areas of contrast change in the source image. I then used several custom brushes of my own creation to digitally paint the picture. For my Photoshop brushes, I used custom brush tip shapes and activated the Shape Dynamics, Scattering, Texture, and Color Dynamics options. These brush controls were set to be sensitive to pen pressure as I was using a Wacom stylus to paint the picture. 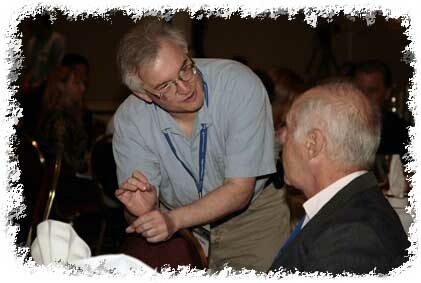 A person who shall remain nameless talking to noted science fiction author Ben Bova about global warming on Mars. I recently completed the construction of a photo gallery for the National Space Society. The 2007 International Space Development Conference Photo Gallery gallery features 148 photographs of the people and events of the 2007 ISDC which took place May 25-28 in Dallas TX. This gallery came into being as a consequence of a suggestion that I made: that having a gallery of photographs of the 2007 ISDC would be a good way of promoting the 2008 ISDC. I was subsequentially given a DVD of photographs taken at the conference by Nancy Ostertag – the photographer contracted for the job. Sifting through these photographs I came up with 148 to use in creating the gallery. Best Smile Award goes to Cassie Kloberdanz. Best Award Presentation Style goes to NSS Senior Vice President Mark Hopkins who gets down on his knees to present former Apollo Astronaut and U.S. Senator Jack Schmitt with the Gerard K. O’Neil Memorial Award. Best Speaker Photograph Award goes to the photograph of Apollo 11 astronaut Buzz Aldrin because of its excellent lighting. While the gallery has been up since last week, it has not yet been publicly announced so for you Artsnova readers, you’ve got a scoop. And if you want to find out who that nameless person in the above photograph is, you’ll just have to search through the 2007 International Space Development Conference Photo Gallery. By way of full disclosure, I currently serve as the Chair of the NSS Web Oversight Committee and am also a candidate in the upcoming NSS Board of Directors election – having been nominated both by the Nominations Committee and by petition. I recently came across an article about teaching computers to appreciate art – at least that was the title of the news story. The story actually dealt with a software program under development that would be able to analyze a work of art and associate it with an artist in its database. The software would also be used to spot art forgeries. The program was created by Daniel Keren, a professor from the Department of Computer Science at the University of Haifa in Israel. The software works by subdividing known paintings by an artist into discrete blocks. Each of these blocks is then mathematically reduced to a formula. The multiple formulas can then be combined and compared with one another. The underlying program logic is that these sets of formulas will uniquely describe the artist that created the associated works of art. Models were created for five artists – Vincent van Gogh, Rembrandt van Rijn, Salvador Dali, Rene Magritte, and Wassily Kandinsky – using 15 painting per artist. The program was then tested against another 15 paintings from each artist to see if the program could correctly associate a painting with an artist. The program was able to correctly associate a painting with its artist 86 percent of the time. Over the course of the article it becomes clear that the program has a very long way to go in order for it to be considered truly functional. I am skeptical as to the program’s chances of ever surpassing, or even equalling the judgments of the art specialist. While this program could develop to the point where it becomes a more useful tool, I can not see it ever reaching a state of reliability such that it becomes the arbiter of authenticity. I am even more skeptical of the ability to apply the program’s technique to the analysis of digitally created art since digital brushwork does not have the same characteristics of traditional brushwork. 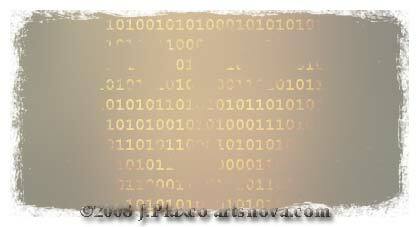 Since this post is about software “appreciating” art, I decided to create an image reflective of the subject. The image used to illustrate this blog entry is a digitally manipulated rendition of that most famous of paintings, the Mona Lisa, also known as La Gioconda, painted by Leonardo da Vinci slightly more than 500 years ago. The woman in the portrait is said to be the wife of Francesco del Giocondo. I was in the book store the other day and came across a copy of Stephan Martiniere’s book Quantumscapes: The Art of Stephan Martiniere . I was surprised to see that it was published in 2006 – surprised that its publication escaped my notice. Either that or has escaped my memory. Surprising since in November of 2006 I had the privilege of moderating a panel – Designing a Spaceship – at the Windycon Science Fiction Convention and Stephan was one of the panelists. It was standing room only for the panel due entirely, I’m sure, to Stephan’s presence. 2006 was the year Stephan won the Chesley Award (named for Chesley Bonestell) for best hardcover cover art – although the award wasn’t given until 2007. He has also won a number of other awards as well. Check out Stephan’s web site at www.martiniere.com. If you’re not familiar with Stephan Martiniere’s art, his speciality is science fiction art. The cover art for Quantumscapes is a piece titled Variable Star which was used as the cover for the science fiction novel Variable Star by Robert Heinlein and Spider Robinson. Quantumscapes is divided into five chapters with each chapter focusing on a different aspect of Martiniere’s art. This is the chapter that shines. It consists of finished book covers which are truly original in concept and execution. Splendid art. Far and away the best chapter in the book. This chapter consists entirely of alien character sketches and studies. Sketches of aliens dominate this chapter with some landscapes as well. Composed of a small collection of alien life studies. This chapter takes the reader through the creative process using as an example the cover art Variable Star starting with rough sketches and finishing with the final artwork. While Stephan’s aliens are original and very well done, it is his landscapes, cityscapes, and spacescapes that excite me and these are only really found in the book’s first chapter. 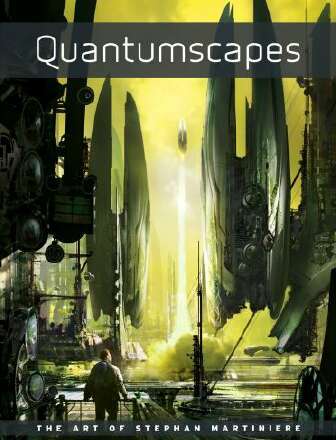 If you are a fan of science fiction art, then you should check out Quantumscapes: The Art of Stephan Martiniere .